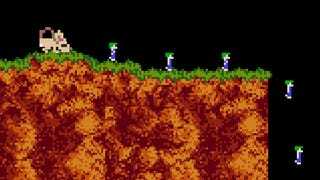 Remember Lemmings? Of course you do. It was that cute puzzle game from the nineties about shepherding herds of the titular critters to safety. Many of my earliest memories of being enthralled by a computer screen come from solving these puzzles. Or trying to, at least. Man, I loved that game. The lemmings were all just so cute and helpless! And hey, the puzzles weren't so bad either. So why did it have to go away? It's hard to pinpoint when or why this happened, but Lemmings lost pace with the modern video game industry. The same could be said for Myst, Pac-Man, even Tetris. People never stopped loving any of the games, however, which made their sudden absence all the more mysterious. 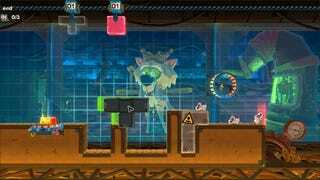 I got an unpleasant answer this week in the form of a new indie game called MouseCraft. I was intrigued by the concept; developer Crunching Koalas billed it as a combination of Tetris and Lemmings. The thought of playing something that revived not one, but two nostalgia-riddled games was too good to pass up. Plus, you play as a cat scientist named Schrödinger. What's not to like? A lot, sadly. And not because MouseCraft does anything wrong. It's a perfectly good game that hits the right notes—at least when it comes to paying homage to its predecessors. But playing through its puzzles over the past few days has forced me to come to terms with a hard truth: maybe Lemmings went away because it wasn't actually as good as I thought it was in the first place. The core objective of MouseCraft, like the Lemmings games of yore, is steering a group of cute little animals (mice, in this case) through a level. What makes it challenging is that you don't exercise direct control over the mice. No matter what you do, they pace back and forth across the level, heedless of any imminent danger they might be walking into. If they walk towards a ledge, they will fall off the ledge—even if it means falling to their death. The only way to stop them is to put a wall in front of the ledge. Then they'll bump into the wall and start walking in the opposite direction. It's your job to usher the mice to safety. And you can only do this by manipulating the terrain of the level—erecting barriers and bridges, or detonating little bombs to remove those same structures, until the mice have made their way to the cheese. The fun comes from the exhilarating feeling of constructing a Rube Goldberg machine on the fly, trying to keep all the moving parts together in a delicate balance just long enough for at least one of the rodents to make it across the finish line. MouseCraft captures a lot of that charm I remember being struck by when playing Lemmings. But it also captures something else, something that I think I chose to forget. Waiting for all those moving parts to come together into a single, unified whole is...sort of boring. To alleviate this, the game lets you fast-forward to expedite the whole mice-walking process. But it's already a bad sign if a game needs to have a fast-forward button in the first place. There's a big, empty space in the middle of the central gameplay loop here. In-between experimenting and seeing the results of whatever testy maneuver you tried to pull off, you have to just...sit there and see what happens. That's not a satisfying feeling. 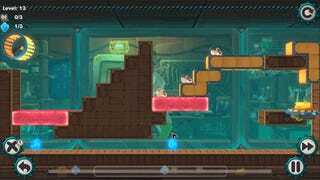 It gets better over time as the levels in MouseCraft become larger and more complex. But the waiting never really goes away. When I compare it to another new puzzle game like Pushmo World, MouseCraft comes up short. And that's for a very simple reason: when your character Mallo pulls out the Tetris-like blocks in that new Nintendo game, he can push them back in immediately. There's an endless cycle of trying and retrying combinations of different shapes and maneuvers until you find the one that actually fits. Being able to try these all out so easily and quickly is what makes it work so well. I fell in love with Pushmo World after playing through one of the tutorial levels. I had to sit through the entire first chunk of MouseCraft, in comparison, before the levels started getting tricky enough to pique my interest. Pushmo World and MouseCraft are very different games, so comparing the two can only go so far. But still: the problem that MouseCraft highlights is one at the heart of the Lemmings paradigm. It's very hard to make the sensation of juggling so many moving parts, trying to control a handful of disinterested and autonomous bodies, fun as opposed to frustrating. The only games I've played recently that manage to pull this off expertly enough to make the quirky brand of virtual cat-herding seem worthy of gamers' attention were From Dust and Pikmin. Everything else that toyed with similar ideas felt like herding actual cats. I'm sorry, Lemmings. I guess this is goodbye. Hopefully, that's just for now.